Coming from the US, redelivery—Fuzaihyou (不在表) in Japan—can be a touchy subject. It’s a common joke over there to hear about our postmen ringing the doorbell and slapping a “We missed you! We’ll try again tomorrow!” paper onto the door while immediately running back to the mail truck. Your mileage may vary though. The States is huge, after all. But how about redelivery in Japan! The point is, fuzaihyou, or redelivery in Japan is reliable, fast, and shockingly convenient. Miss a mail due to work or being out of the house, and a paper will appear at your door. In most cases, this paper will be from the national post—Japan Post—or a private service such as Kuroneko. If it’s JP Post, the official wording is 郵便物等お預かりのお知らせ (ゆうびんぶつ とう おあずかり の おしらせ), but it’ll be that piece of paper on your door if you’ve missed your package. Deliveries can be rescheduled by: a 24 hour telephone answering system (English is available, but comes at a premium charge), going online from the Japan Post website, mail (using the notice on your door), or fax (do you still use fax? I’m in no place to judge. Plenty of companies in Japan still surprisingly use it). Considering you’re using the internet to read this article and are thus internet savvy, let’s go over using the Japan Post website. First of all, grab your notice and head over to JP Post’s tracking website link at https://trackings.post.japanpost.jp/delivery/deli/. In the box in the middle of the page labeled “Please enter Notice Number,” put in the 6, or 11-13 digit notice number on your paper and click on next (次へ進む、つぎへすすむ). Under #1, labeled “郵便番号を入力してください,” enter your zip code. 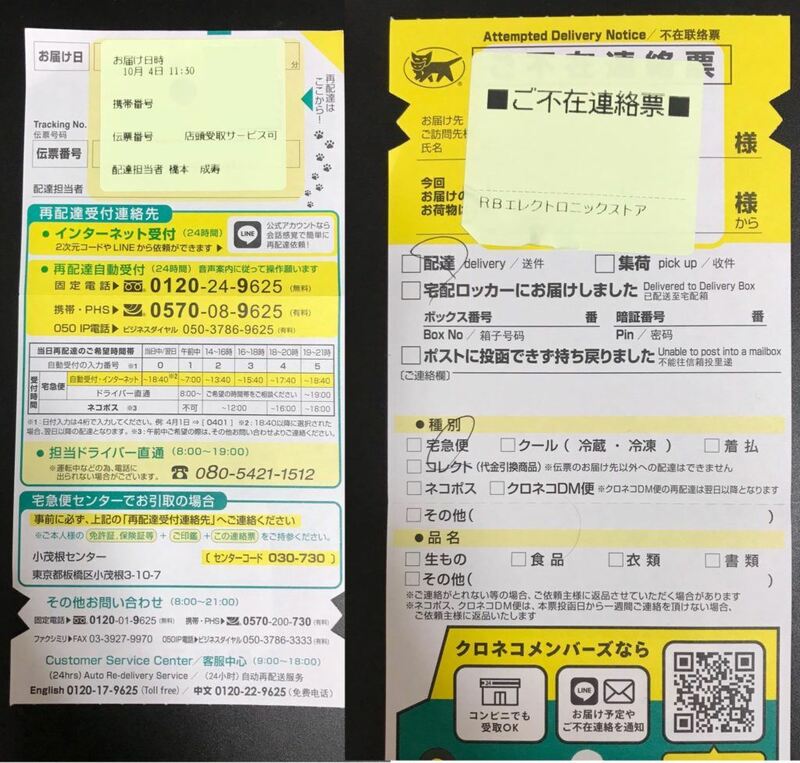 Under #2, labeled “ご不在連絡票のお届け日を選んでください,” it also says in English, “Please select Delivery Date.” This can be a little confusing, but what it means is the date in which you missed your package, or the date they came to your house to deliver and you weren’t there. #3 asks for the type of mail you received. Though this looks like a long list of hard to read Kanji, each one has a number next to it. On your paper, you’ll find one of these numbers. Simply match your number to the one on the list and voila! The last page is a list of dates and times you’d like your mail to be delivered. Simply click your most convenient time, input phone number, name, and e-mail address at the bottom, and you’re finished. There will be a confirmation page afterwards to check up on, so double check your info and you’re off! It may seem a little confusing with all the crazy Kanji, but a majority of it has English translations at the bottom. Keep that notice handy on you and you should be good to go! To find out more about life in Japan, check Go! Go! Nihon blog out, or contact us for questions about school or student visa application procedure in Japan.